So eventually I imagine we will have lots to say about the places we live temporarily but Aquamarina (www.aquamarinarvpark.com) will always be special because we stayed here for over a month, as Pat was going to language school and building up his skills. And let me be the first to say, this isn’t the traditional overland spot, but still think it’s a helpful resource to overlanders who are passing through for the ferry. I wanted to wait until we were done with our stay to be sure of my thoughts. In a nutshell this place is awesome!! 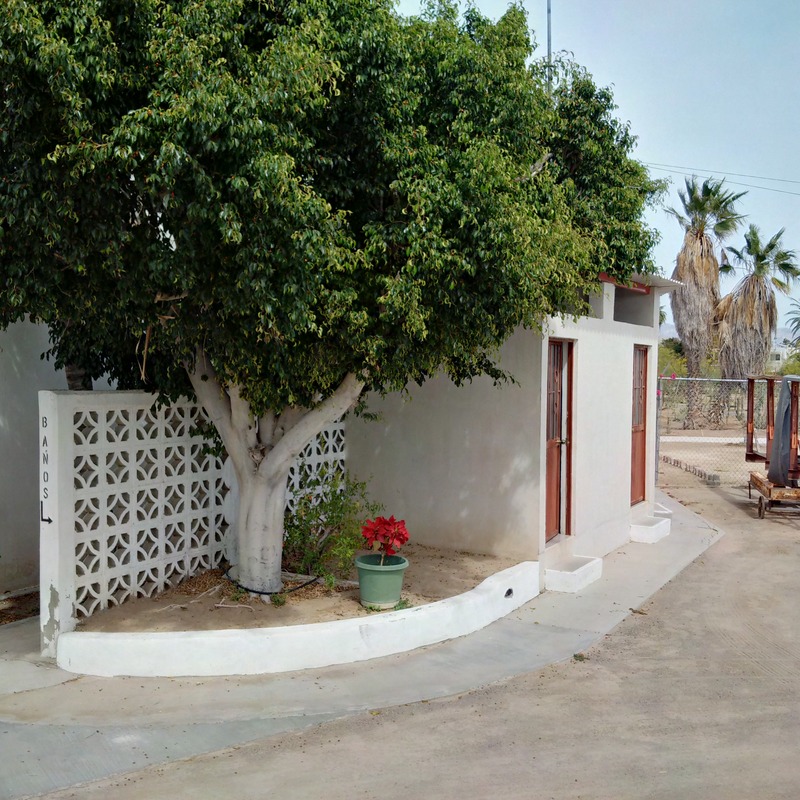 La Paz, doesn’t offer many rv parks or organized camping at all. 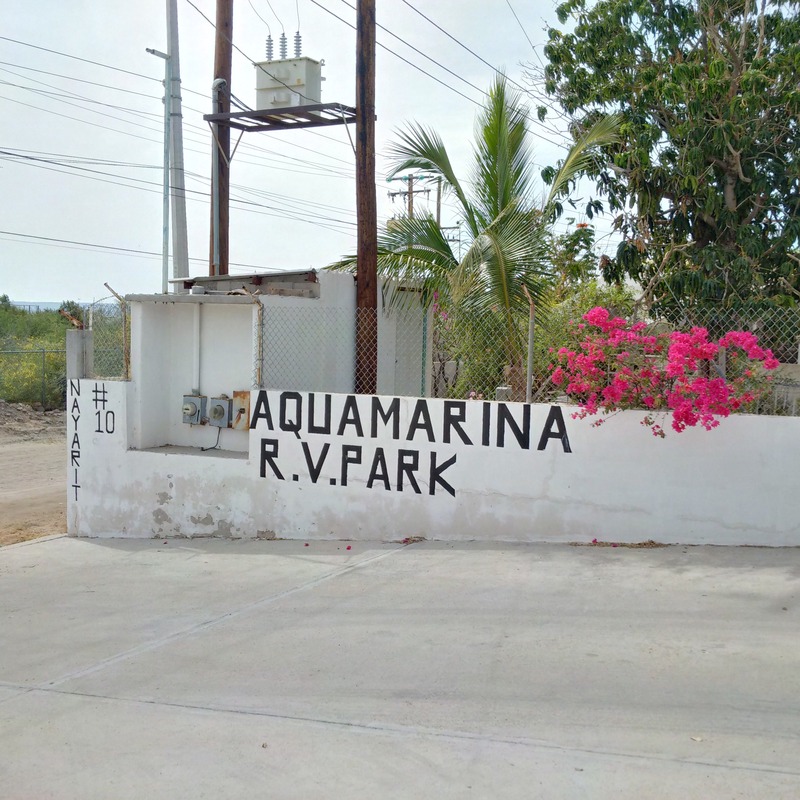 Within the city limits there is only Aquamarina, and outside the city a few miles is another park that is a bit cheaper but not as convenient as Aquamarina. 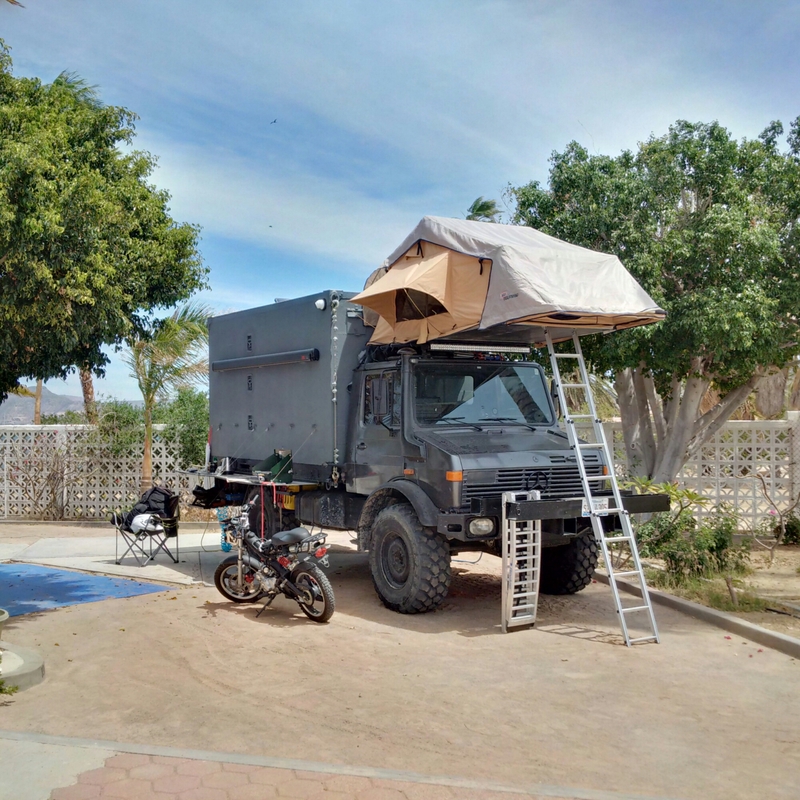 There are a TON of free beach camping outside of the city and stealth camping on the street could probably be accomplished as well. But if you are open to paying a bit to recharge and restock it could be a great spot. The park is situated just away from the main drag of town (the malecon) it’s technically about a mile along the same actual road. It’s located at the end of a residential street which dead ends at the beach. The park is completely gated and sits higher than the street level by about 5 feet. The security is excellent and mostly unneeded in this part of town. When you check in you get a clicker to the automated gate and can come and go as you please. There are about 15 spots and the spots are huge, as they were made to accommodate the big Class A rigs. There is the spot for your rig and then a concrete patio and another area for you to either park your runabout vehicle or more living area. Each spot has wifi, electric, water, and sewer. Each spot is meticulously cleaned and manicured with the staff grading the hard pack dirt and picking up leaves. I have never seen such a clean park. Outside of your spot, there are two full baths available for use and they have been kept spotless and seem to be cleaned after every use. There is a rooftop terrace above some vacation rental apartments that is open for use. 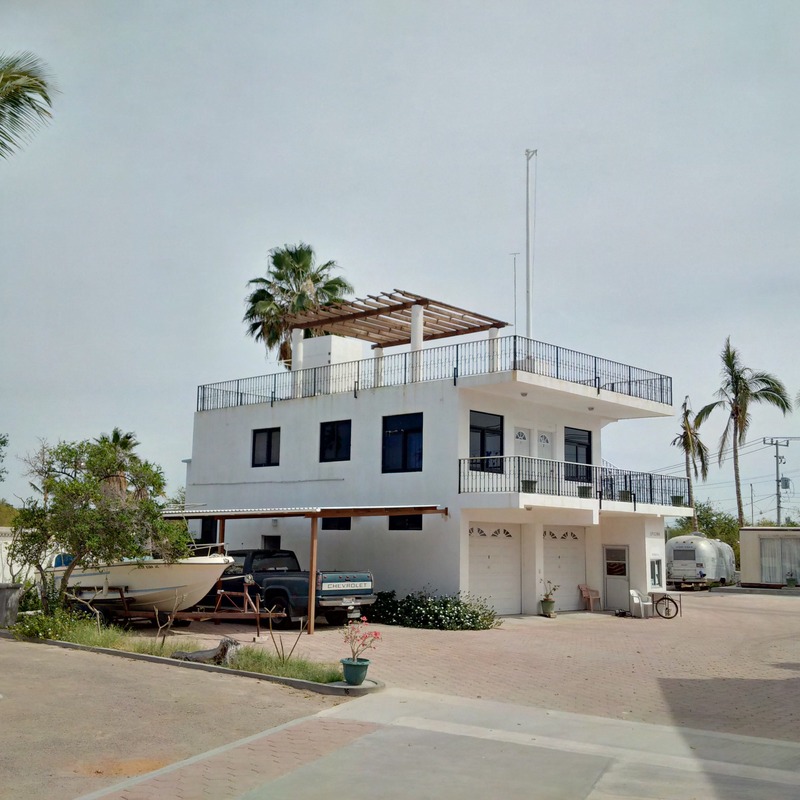 There are also kayaks for rent and use, a covered patio with chairs and tables over looking the water, and then actual access to the beach and a little restaurant just outside the gates. The roof top terrace up there is open to all! The park is owned by an older woman who, with her late husband, ran the first overnight dive ships in the bay for almost 40 years. She lives in a house in the center of the park and is still active in its management and has lots of wonderful stories to tell. Her son Roger and a couple staff members handle all the day to day tasks and are great guides to what to do in the area, but also don’t encroach on your space. 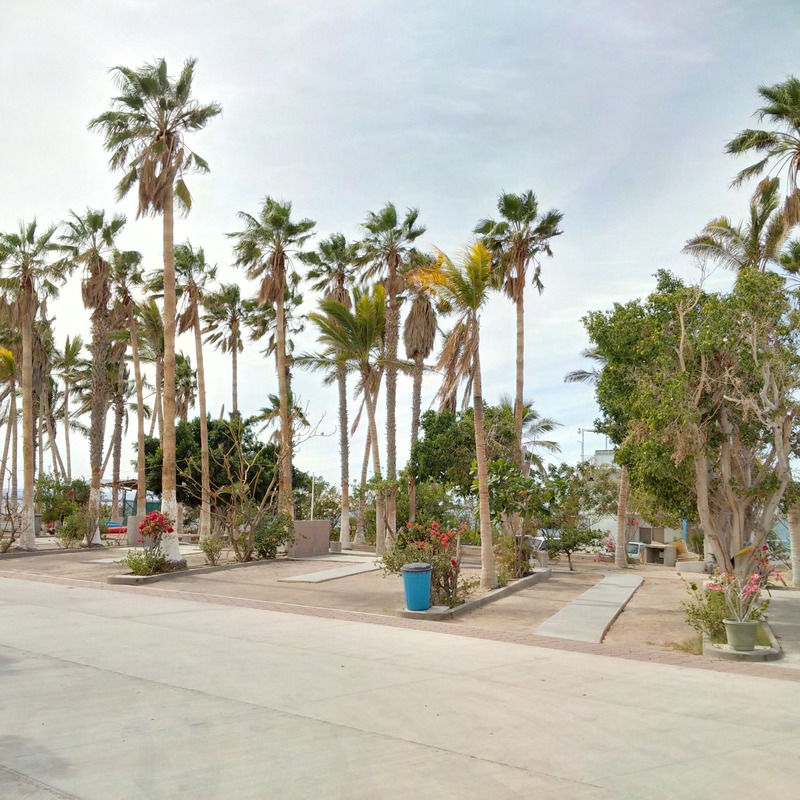 Access to the main areas of La Paz are about 15 minutes or so by foot and you are right on the Malecon with all of the shops and restaurants and it’s a straight walk. You are also a two minute drive from the big chain stores from Home Depot to Walmart if you need or want to stock up your rig before taking the ferry. The ferry terminal is a 20 minute drive from the park, making this a great stop before crossing to the mainline. But I would definitely recommend it, even at current prices for those taking the ferry. It’s a great destination where you can get yourself refueled, restocked, and clean before tackling the ferry and the mainland. Randall â Nice article. We could not agree more with your assessment. One add: ARV Park also has great group facilities which enable the traveler to easily meet other campers. We are back in So. CA and will be heading home to Portland in a few days. Good luck to you and Pat. Good add my man, very true and very nice. Good luck on the trip home! We will definitely meet up again.